There is something very special about the Kruger National Park, something that keeps pulling us back, constantly wanting more. Whether it’s the stillness of the early morning savannah as the huge orange sun rises through the mist or the excitement of spotting a pair of cheetahs by the roadside when you are the only car in sight, there really is nothing like the Kruger. We returned for our fourth (and joint longest) trip to the park a couple of weeks ago. Having spent all our previous trips in the south and central parts of the park, this time we decided to see what the far north was like. But knowing that the south was where the most wildlife tend to be found we knew – for the sake of the children at least – we would need to spread ourselves out. Hence our trip started right in the south in a tranquil bushcamp called Biyamiti (no restaurant or shop, only a small number of guest cottages) and ended in the far north at Punda Maria. 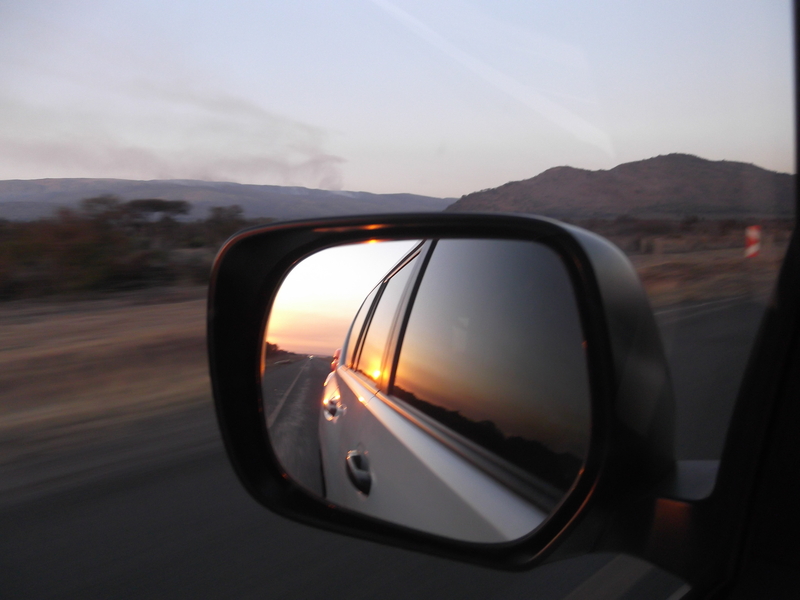 Along the way we also stayed at Satara, Olifants and Lataba. Arriving at the park after a long drive from Pretoria we did what all Krugerholics do the moment they are through those gates – pick up a camera, get the binoculars handy, open the windows and breathe! Even though it was getting late, we still managed a few good sightings on our drive to our first night’s accommodation – including our first ever (fleeting) honey badger. Then as we arrived close to Biyamiti this happened. Elephant jam! As you can see from the photo, it was getting dark and the camp gates would be closed in ten minutes or so…..the gentle giants even looked like they were going to settle down to sleep in the middle of the road at one point. But after a bit of polite revving by the car in front they eventually moved and we were able to get to the camp in time. Those elephants set the scene for the rest of the holiday. I am not sure if it was the time of year or whether we spent more time in the centre and north of the park than usual, but we have never seen so many elephants! This included one of my favourite ever Kruger experiences when we came across a huge herd of them playing in a dam near Satara – all the youngsters literally jumping on each other in the water, the mums with their babies keeping watch from the edge. It was a magical site – I could have sat there all day and watched as they chased off a small group of buffaloes minding their own business, helped one of the baby’s out of some mud, and generally larked about like typical teenagers the world over. The next day though we had what has to be one of our top three wildlife sightings since we have lived in South Africa. We rose early to give ourselves the best chance of seeing something good. We were staying in Satara which is close to the S100 – a road that many consider the best road in the park for lions. At first we had one of those mornings of nothing…nothing…nothing….why did we get up so darned early….nothing…. Someone in one of the other cars pointed up an embankment into the distance. “There’s a lion coming,” they told us. It was hard to make out but yes there were two ears bobbing along behind some bushes. It wasn’t that exciting at this stage and at least one of the other cars drove off. But she (we finally worked out it was a lioness) came closer and closer and then suddenly there was another. And behind it, another. And they just kept on coming and coming and walked down the embankment literally right past our car. And in the middle of the cats was a white lion – one of the rarest sites in the park (I am assured by those that know that this is the only one that is known of in the main part of the park; there is apparently another in Greater Kruger which includes the concessions at the edge). We sat as they passed one by one and then we went round the corner and watched them all settle in the shade of a couple of trees. The white one seemed to be just one of the pack which was nice to see – I am guessing he had no idea he was any different from any of his brothers! Following that sighting we didn’t think the Kruger would have anything better to offer on this trip but we would be wrong! The next day started out as one of those quiet but perfectly pleasant mornings when you really don’t see much to write home about but still lots for your own personal amusement – like these buffaloes using a branch to scratch an itch. When suddenly down a long, quiet road we spotted two cars pulled up by the road. We drove up next to them but couldn’t see anything. I shrugged at the man in one of the cars, indicating that I was confused and he pointed down right in front of where they were parked. Cheetahs! And there they were, two of the most beautiful animals you will see in your life, just lying ther by the roadside totally unaware that they were being watched. The other cars drew off but we sat with them for about half an hour, watching as they stood up, sniffed and quivered at some impala up the road, willing them on to start a hunt so we would get the chance to see these magnificent creatures in full flight…. They didn’t though and in the end we left them to it – passing just two cars on our way on to the main road, but enjoying watching the faces in the cars light up when we told them what was waiting for them just up the road. But then just around the corner, something in the road – a snake! I realise for some people this isn’t what they want to see but from the safety of our car I am always happy to see one, especially when it is later confirmed to be a deadly puff adder! We eventually arrived at my favourite camp in the park, Olifants with its fantastic view out over the Olifants river. But it was the antics of the baboons that occupied us more than the view this time – the cheeky monkeys had already broken into our neighbour’s cottage just as we arrived and were running around with rusks and oranges in their hands. Then, the next morning two of them made a raid on our breakfast table, using my eldest daughter as a spring board in their bold attempt (failed) to steal our packet of muesli! The baboons are quite a pest as they have learned to open bins, windows, fridges, car doors…but they are very amusing to watch! From Olifants it was on to Lataba which is proper elephant country – there is even an elephant museum here, chronicling the lives of the “great tuskers” – a number of giant males with huge tusks who earned fame back in Ye Olden Days (they have recently agreed on some new tuskers to take over the mantle from their reverent ancestors ). Everywhere we went – elephants! Not that I minded, I love elephants! And at some point on the road we crossed the tropic of Capricorn and found ourselves officially in the tropics – it did get noticably warmer as we went further north although it still cooled down at night to a pleasant sleeping temperature. And so we came to the end of our epic trip. We wanted to do the last bit of Kruger right up into the corner where the three countries (South Africa, Zimbabwe and Mozambique) meet. But in the end we simply ran out of time, and had had enough time sitting in the car. So we didn’t quite make it – but this means one thing is for sure: there’s a very real resaon to come back. Not that I think I will need much pursuading! When we came to South Africa we knew we would see animals. Probably quite a lot of them. And so far we haven’t been proved wrong. It has been an animal smorgsboard from day one. But I don’t think I believed we would ever have such a great time as we did in Madikwe recently – a fantastic, malaria-free (this is important because the most-famous park, Kruger, isn’t), “Big 5” game reserve just four hours drive from Pretoria. Madikwe is a well-managed park: to “safari” there you need to be staying at one of the lodges, and the guides all coordinate so there is never more than two vehicles at a siting at once. Sometimes they keep it to just one. This certanly gives the reserve an air of “exclusivity,” although I can’t pretend you don’t pay for this privilege. Anyway with 30 lodges to chose from, it wasn’t going to be easy to decide where we would spend our three nights in the park. But luckily only a few are regarded as “child-friendly”, with several not accepting children at all. Plus, we had heard wonderful things about the Bush House – and in particular it’s underground hide, which allowed you to get within spitting distance of the elephants. So close in fact that often all you could see were their feet! 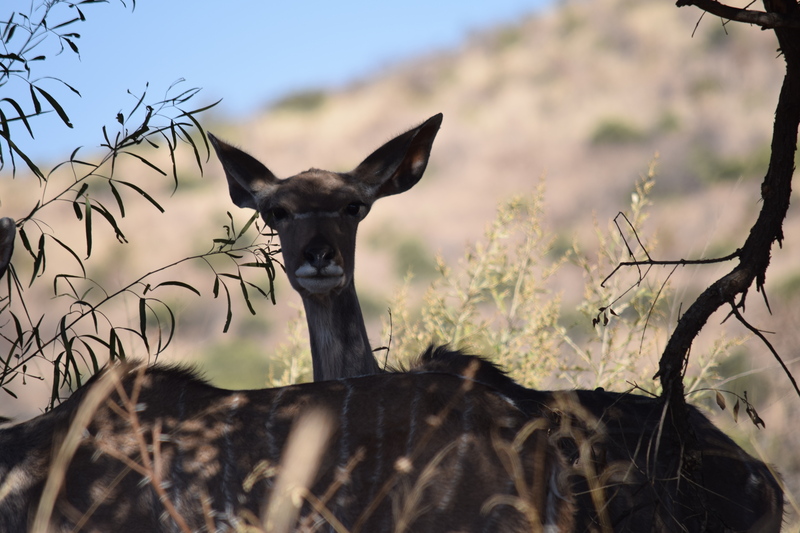 We stayed for three nights in Madikwe, and went on six game drives in that time (three in the morning, three in the afternoon). Each drive lasted more than three hours so in total we spend more than 18 hours sitting on our bums in an off-road vehicle. But it never felt that long – there was so much to see that the time always passed quickly, plus the stops for Amarula-filled coffee in the morning and sundowners in the evening helped! Amarula with your coffee? I won’t say no! We were woken every morning at 5am by a tap on the door from our trusty guide Greg. Now usually it’s impossible to get our younger daughter out of bed at 6am to go to school – but here she was up and dressed in no time each day: although the drives were long (and she ended up taking a book to occupy herself during the quieter moments! ), she was excited as the rest of us to see what that morning would hold! Baby zebra foal – probably just a few hours old. This guy was found because of his rather ostentatious dinner hanging in a nearby tree – leopards are well known for dragging carcasses up trees and leaving them there for when they feel like a bite to eat later. Nevertheless, we would never have spotted him hiding in a nearby bush, their camouflage is fantastic. It is at times like these that you really appreciate the skills of your highly-trained guides. We also found a number of lions during our stay – two brothers who seemed to “rule the roost” one evening, a group of ladies another and finally another small pride complete with cubs on a third outing! It really did feel like quite a privilege. We saw so much it is hard to choose which pictures to share, but there were two sightings that probably stood out (as well as the leopard). The first was our amazing encounter with the park’s only pack of wild dogs (70% of the reserve’s dogs were sadly wiped out last year by rabies). Wild dog pup proudly shows off his kudu ear! We observed the wild dogs for about five minutes before moving off and allowing another brave truck to make the thorny-route into the clearing where they were polishing off the remains of their dinner. A truely magical experience! We were able to sit quietly and watch this beautiful cat as it made its way round in circles, marking its territory, completely nochalent about the car full of humans sitting and watching him go about his business! So all good things must come to an end and we finally reached our last night at the Bush House. 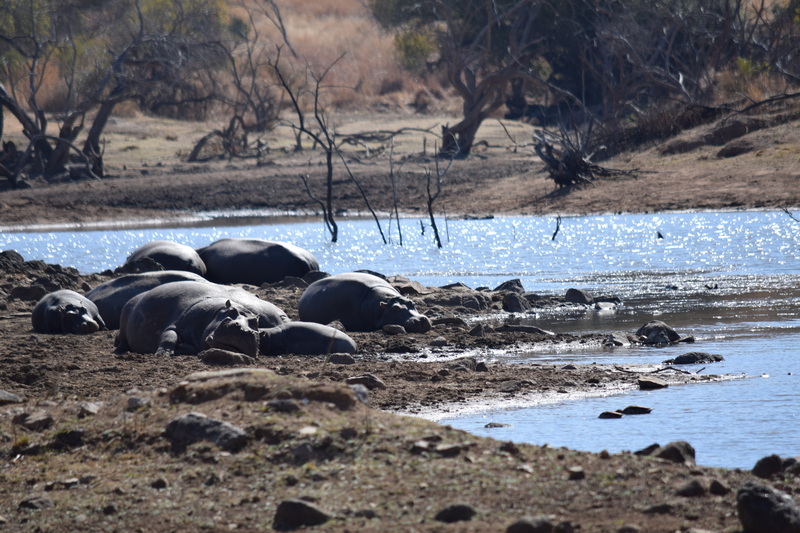 We had had some great game sightings but, due to the fact that it had recently, rained the lodge’s waterhole was quieter than usual (the game finding their water in other places). However, the last night came good and we had a parade of animals – elephants, rhino and a huge herd of buffalo – making their way down to the hole. It was truely a magnificant way to end an amazing holiday! 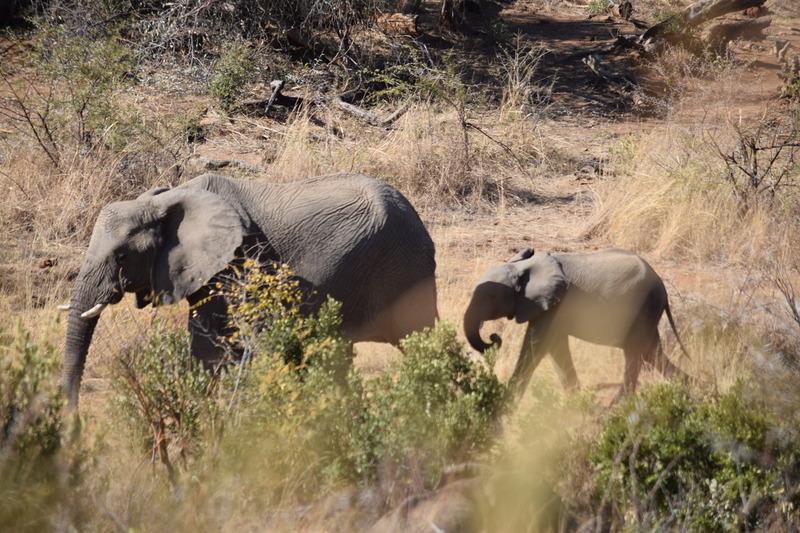 If you are visiting South Africa I can thoroughly recommend the Bush House (even families with younger children can be accommodated – a Dutch family staying at the lodge with us had organised private game drives with their three-year-old). We will be going on a self-drive tour to Kruger later this year, malaria tablets and all. I am sure it will be a totally different experience, not least of all trying to work out how to feed us all for six days! But if it is ease and relaxation you are after then look no futher than Madikwe. Mr Weaver fails to attract a mate…. One of our favourite garden activities here in Pretoria is watching our resident weaver bird build a nest, in a desperate attempt to attract a mate. Basically, the male weaver skillfully creates an incredibly intricate round ball of a nest, stripping the tree of its leaves at the same time, and then madly displays (hanging upside down and shrieking) everytime the female he has his eye on comes anywhere close. This whole episode took place in our garden over the course of a weekend – the lady bird did come and have a look, even entering the nest at one point. But sadly she obviously wasn’t impressed because the next day, Mr Weaver totally destroyed his own masterpiece, leaving it in shreds on the floor (and in our pool, which is directly below his chosen tree). Well, you can’t say he hasn’t tried at least! Update: Since I originally wrote this post, Mr Weaver has made (and destroyed) about four more nests. Mrs Weaver is still around and has occasionally shown real interest im his latest creation. But it appears her standards remain too high as he is in the middle, once more, of tearing apart a nest that we thought looked pretty complete! Following a trip to Cape Town and Hermanus a week or so ago, I decided we had seen and done too much to concertina everything into one blog post. Hence the birth of a new short series – the Cape Town posts. Post #1 featured our visit to Kirtenbosch botanical gardens, where we picnicked with the long-lost rellies. Here is post #2 – a little more exciting, a little more smelly and hopefully a little more cute. 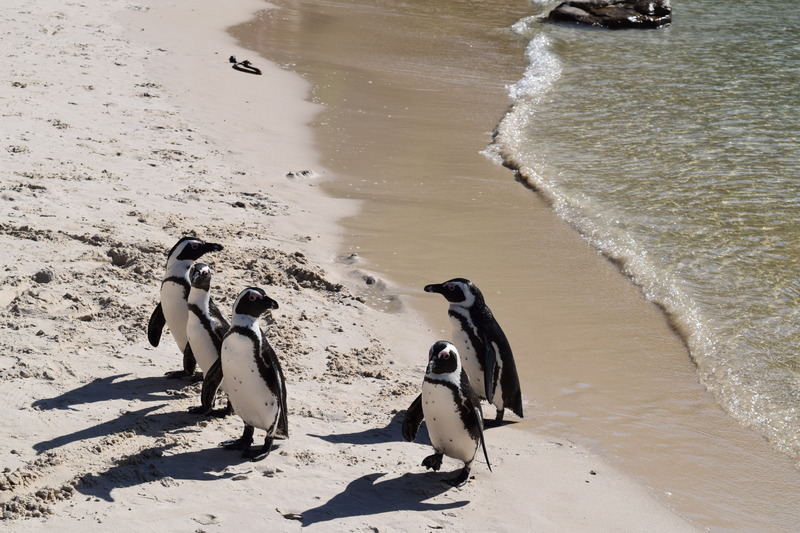 When we first told the children we were moving here to South Africa – something you can read about in this post – one of the promises we lured them with was the opportunity to see penguins in the wild. And that we would go whale-watching. So one of the first trips we booked was to Cape Town in October – where we would be able to tick both of these items of our “to-do” list within a couple of days of each other. After the visit to Kirstenbosch (which you can read about in the first of my Cape Town posts), we drove over to the other side of the peninsula and down to the penguin colony at Simonstown. On the way we stopped to look at a beautiful panorama over one of the many pristine beaches in that region – marred only slightly by the fact that a shark-watcher was perched up on her seat by the road looking out for any ominous shapes in the waters below…. 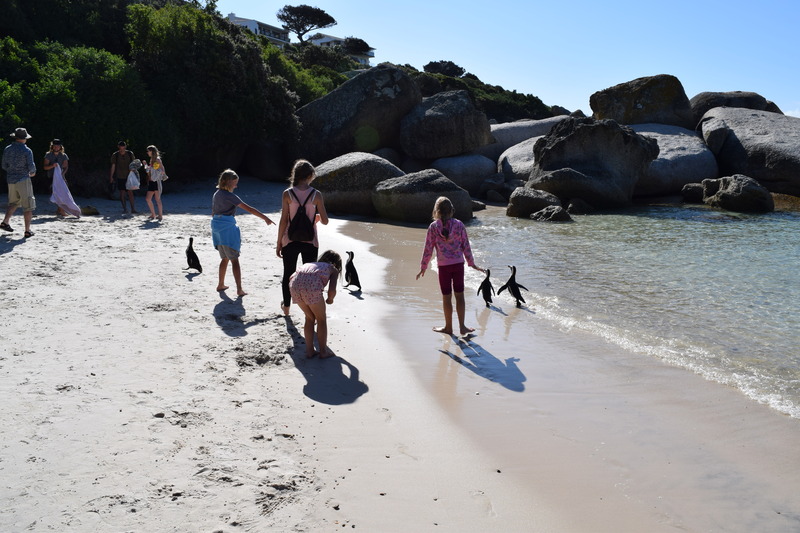 We reached the famous Boulders Beach where penguins live side-by-side with their human neighbours, apparently completely unafraid and therefore probably as tame as you will find any wild animals to be. The children were straight in there, getting right up close and personal with the cute little black-and-white fellows – although making sure not to get too close as there were plenty of warnings that the birds do bite! Is this the right beach? Where are we? Who brought the deckchairs? We visited another penguin colony a couple of days later in Betty’s Bay on the way to Hermanus – they really are the most engaging creatures and I don’t think you can ever have too many penguins! 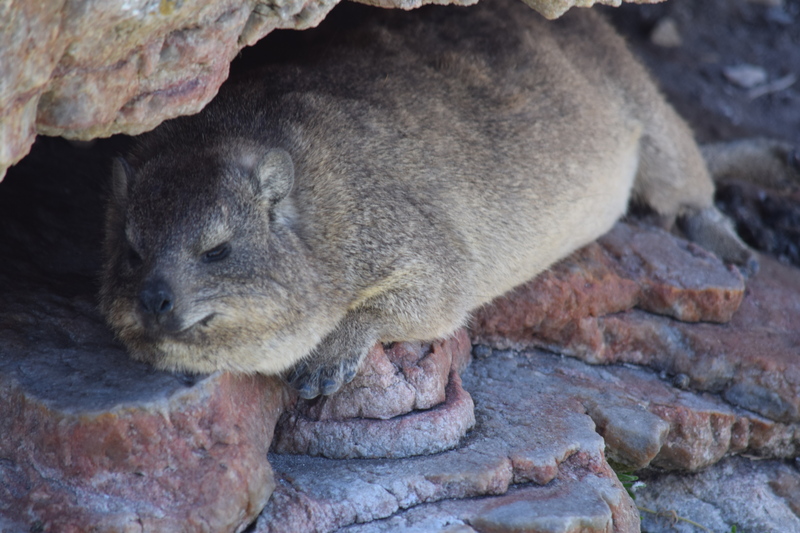 However, as well as penguins one of the other cute creatures you come across a lot here are locally called Dassies (pronounced Dussies) – also known as rock hyraxes. These fat and furry guinea-pig like creatures are found wherever there is a warm rock to sun themselves on, although weirdly their closest living relative is apparently the elephant! 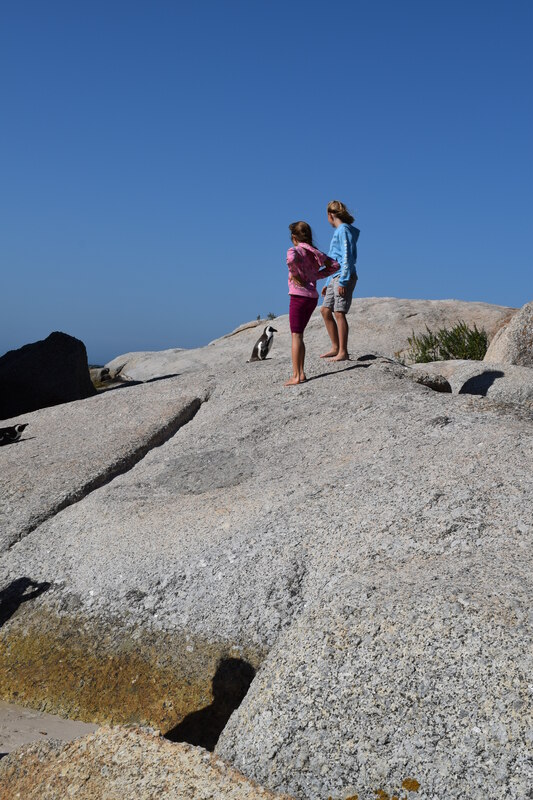 Anyway we found them all over the place – Table Mountain, rocks by the beach, next to the penguin colony…. We eventually left the penguins behind and made our way to the second stop of our short Cape stay: Hermanus, a town on the coast which seems to have based its entire economy on the excitement of whale watching. 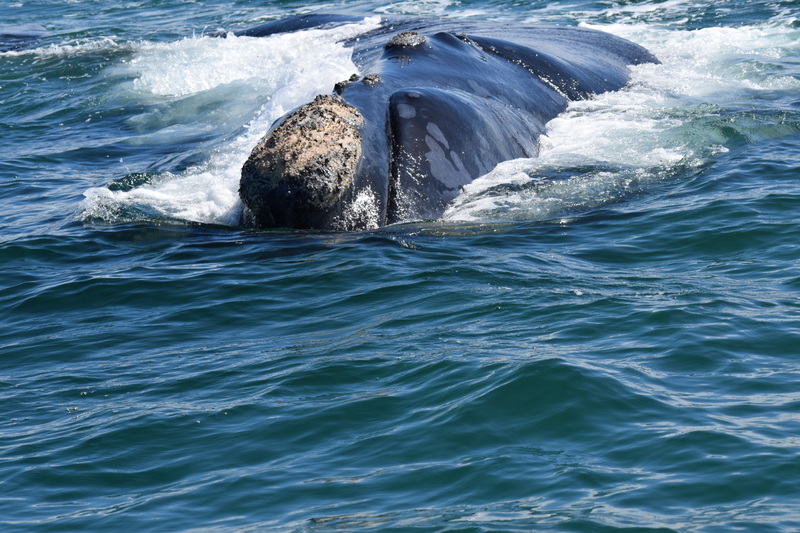 One of the reasons this is such a popular thing to do down there is because at this time of the year you can almost always see whales from the coastal pathway without the need to go out on a boat trip. 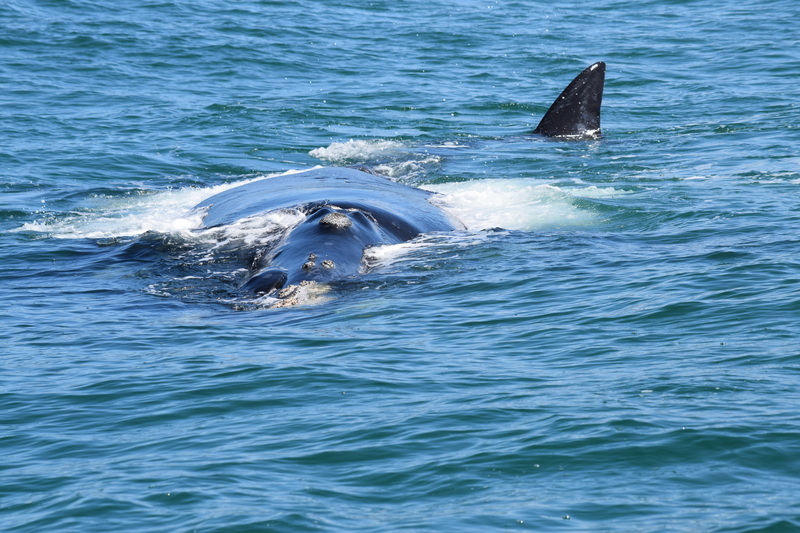 The waters off the coast of South Africa are a popular mating spot for the whales – the mums then hang around for a couple of months until their calves are old enough to make the trip back to Antartica. Thus many of the whales you see around there are the mothers and babies. 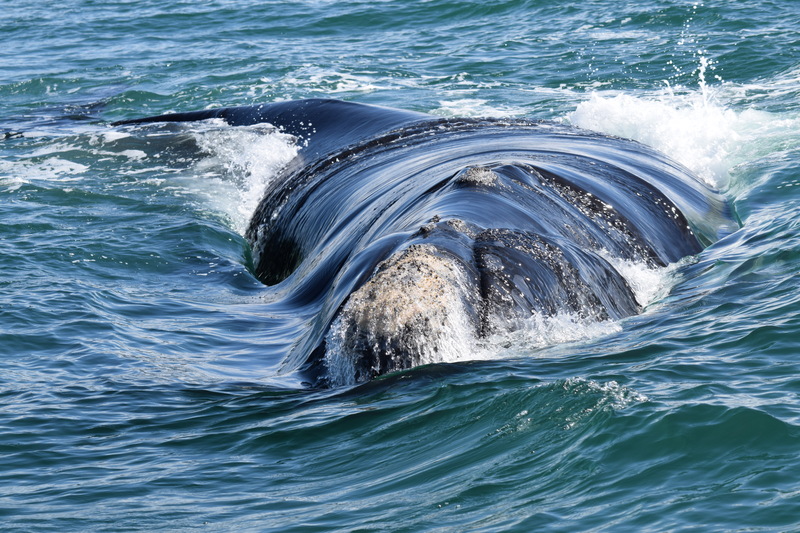 We did see whales breaching (jumping right out of the water) but it was a little further away and you try taking photos of a whale jumping – most of the results tend to be of a big splash or a few bubbles! Anyway we were more than happy with our encounter – in fact I would say the whole experience was quite breathtaking and more than exceeded our expectations. I don’t think our daughters thought for a moment we would get this close – it is another of those experiences (along with very close meetings with elephants and rhinos) they are unlikley to forget in a hurry. We really enjoyed Hermanus – Cape Town is gorgeous and has lots to do, but Hermanus felt less rushed. It was nice to be able to walk around, even at night, without worrying too much and not to have to sleep behind bars. We were also lucky to have an unexpected visit from another long-lost relative – another 2nd cousin of mine who dropped in on his way home to Mossel Bay from Cape Town and ended up staying the night so he could enjoy a glass or two of wine! Talking of wine that whole area is well known for its wine-growing and we passed winery after winery as we drive around the region. Sadly we didn’t have time to go on any wine tours but this leaves us with an excellent reason to go back! 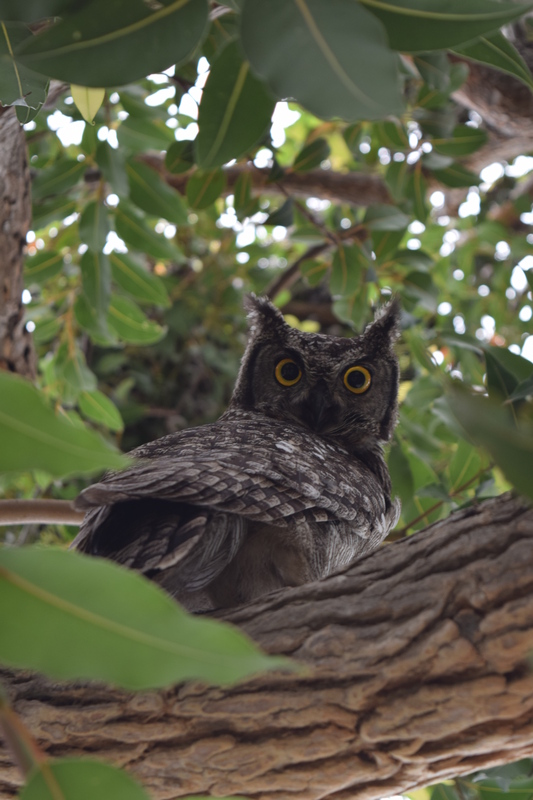 But one last creature to delight us during our stay was this magnificent owl we found perched in a tree outside our guest house. It may be a common bird in that area, I am not sure – but it was certainly eye-catching! I realise that for many people who have been to South Africa, or other bloggers that live here, what I am about to describe will be pretty tame stuff. 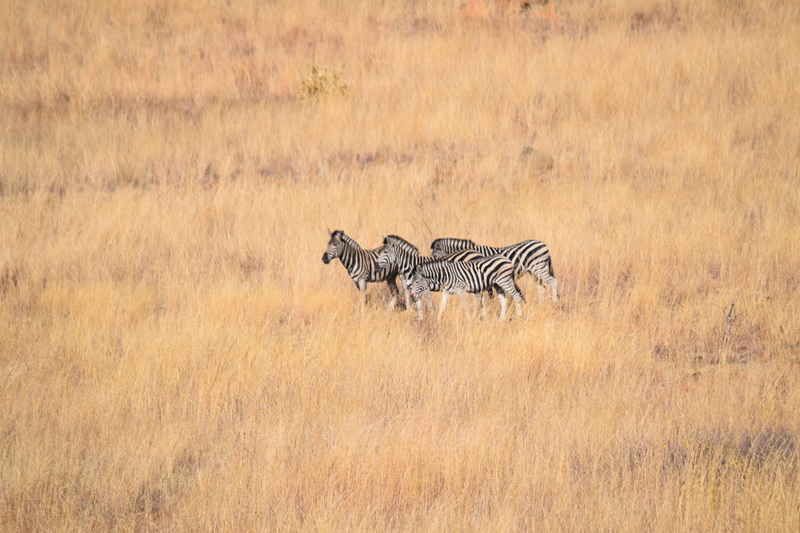 There is so much to do and see here, and so many people writing about it and photographing it, that you have to do more than just describe a trip to see some fairly commonly spotted animals at an easily accessible gamepark to get noticed. But I don’t care. I don’t profess to be some big travel blogger trying to make a name for myself. I’m not hoping to get my pictures picked up by National Geographic, or shared on some viral travel site. I just want to describe a brilliant day where we saw some beautiful and magnificant animals in their natural habitat and which led to my youngest daughter laughing with such delight that she just forgot, for a moment, that she really doesn’t want to be here. 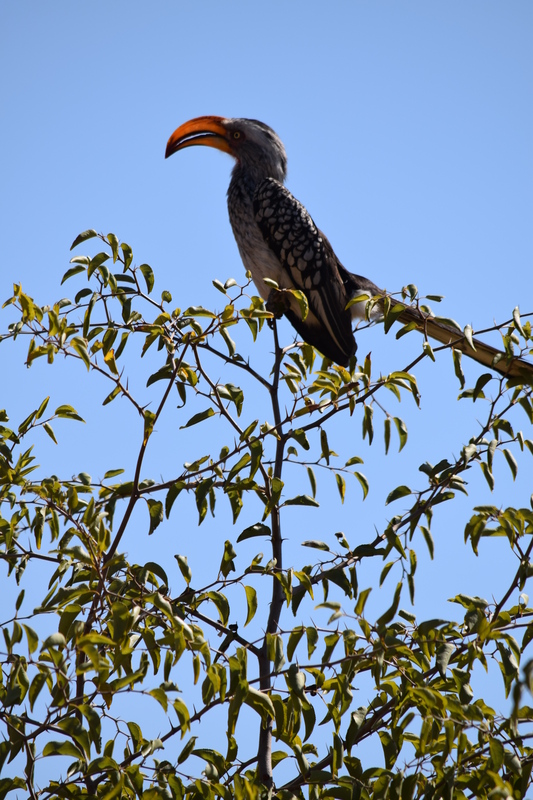 Pilansberg is the closest “proper” park to Pretoria – ie one that is a full day out of game-spotting, that has lodges and such attached should you so wish to stay close enough for those early-morning drives. If you have seen the film Blended, this is the park they visited. Our day started at some ungodly hour – 5.30am or something horrendous. Coffee was downed as we bundled the girls into their warm clothes (it’s winter here remember and although the days are bright and sunny, it gets pretty damn cold at night!) and set off through the still-sleeping city. Thanks to the lack of traffic we were on the motorway out of town pretty quickly and watched the sun rise behind us as we sped past the little settlements scattered along the side of the road. When we finally arrived at the park gate, we found a rather long queue outside the ticket office – which seemed to be moving verrrrrry slowly.. When we finally got to the front, we realised this was because every car coming in had to have their numberplate noted and phone number of the occupants taken. I guess this is because they need to check that everyone has actually left the park at sundown…yup, we’re not in Disneyworld now….. Yes it’s a rhino! 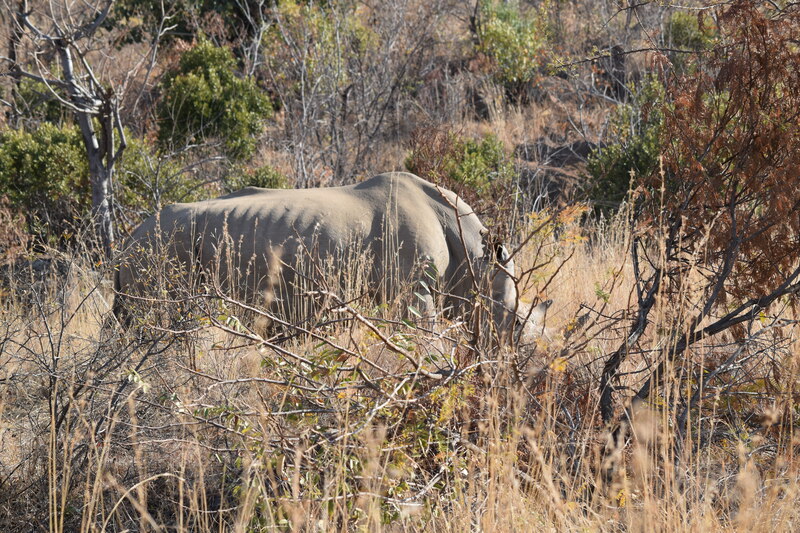 Ok it’s not the best picture of a rhino but he/she would insist on hiding behind a bush. And I wanted to include it because it was the first “proper” siting of the day…. But things only got better because just around the corner from this rhino was…. Yes, he was in the road. 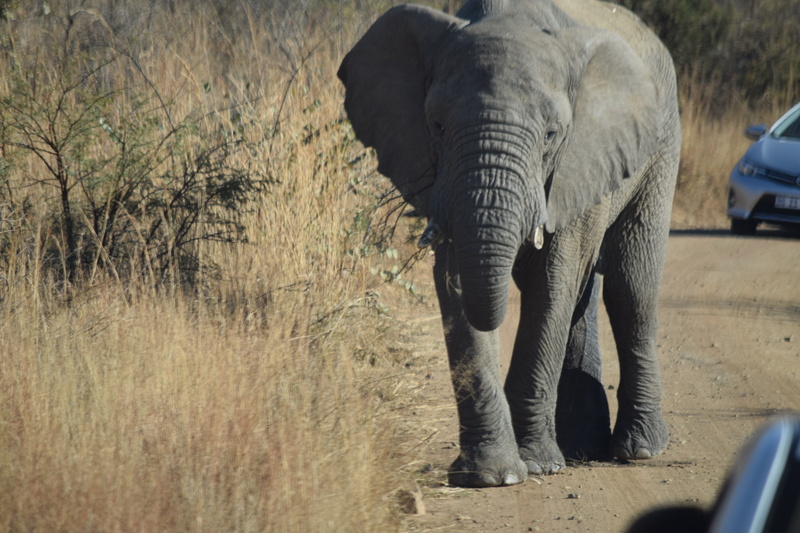 And yes, he did start walking towards us flapping his ears….luckily he then decided to take a turn off the edge of the road and strode past our car just metres away. My youngest daughter, who had professed that elephants were what she wanted to see most in South Africa, laughed with complete delight. It absolutely made the whole hassle of getting here worthwhile. I have more pictures but I realise that I will probably be boring you if I put up too many! I am very conscious that we will be seeing a lot of wildlife over the next couple of years and I don’t want to be that person who everyone moans about – oh no, not ANOTHER picture of a flipping elephant! But this was our first and it was a fabulous Welcome to SA so I thought I would share it with you. There’s still plenty more to see (cheetahs, leopards, closer views of lions, chameleons, dung beetles, bushbabies, meercats, all the creatures of the sea like the whalesharks and the manta rays….) so I am sure I will post some more pictures from time to time. But for now, I will enjoy the memories of our first South African Safari.